The Monarch Casino (left) has nine-figure plans to upgrade its facilities and add a hotel tower (rendering, right). Images courtesy of Monarch Casino & Resort Inc.
A Black Hawk casino announced plans in February to build a 23-story, 500-room hotel as part of a $300 million renovation. Monarch Casino & Resort Inc., which also owns the Atlantis Casino in Reno, said it plans to bring a new hotel tower to Black Hawk and double the size of its casino gaming floor by the end of 2017. Monarch, a publicly traded casino operator based in Reno, purchased the former Riviera Black Hawk Casino in 2012 for $76 million and changed the complex’s name to Monarch Casino Black Hawk the following year. Construction is already underway on a new parking garage. When that work is finished, the current garage will be demolished and the company will break ground on the hotel. 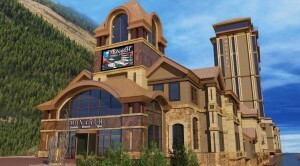 A rendering of the main entrance after upgrades. “There’s only one market that has higher gross gaming revenue per hotel rooms than Black Hawk, and that’s Macau (China),” Farahi said. 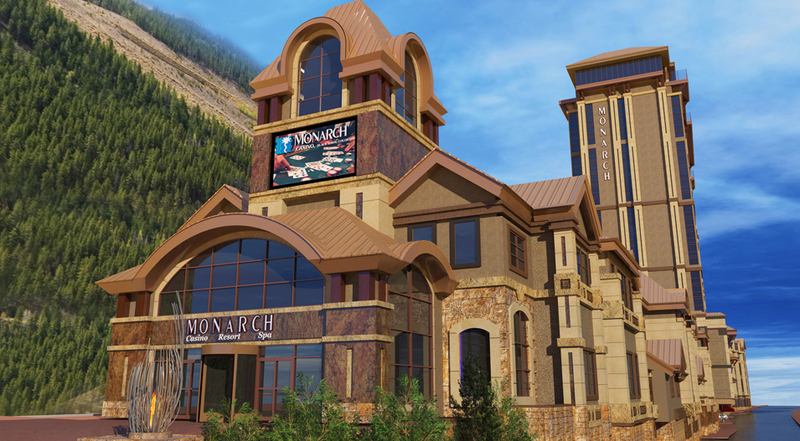 In addition to the hotel, Monarch will be nearly doubling the size of its gaming floor to 64,000 square feet. Work on the gaming area is already underway. Before the renovations started, the casino had about 700 slot machines and 11 table games. In December, Monarch opened a new second-floor casino and has started renovations to the main casino floor, according to a press release. 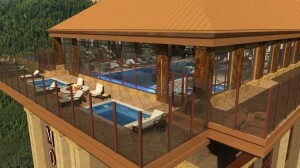 Monarch will also add four new restaurants and a spa designed by the same company that handled its Reno spa. Monarch’s hotel with compete with the nearby Ameristar, a 33-story, 500-room casino hotel that opened in 2009. The Monarch hopes to bring in more guests with hotel pools and other high-end amenities. Jack Lewis, the city manager in Black Hawk, said the town is eager for the increase in tourism. The majority of Monarch’s current visitors come from the Denver-Boulder region, Farahi said. Monarch expects construction to cost between $285 million and $295 million total. The hotel and casino upgrades will account for between $229 million and $234 million. The company is financing the project partly through loans from Wells Fargo and Bank of America. Once the upgraded casino is fully operational in 2017, Monarch expects to hire another 1,000 employees in addition to the facility’s current 300-person staff, Farahi said. The design for the building was done by MBA Architecture & Interior Design; the Reno-based firm previously worked with Monarch at the Atlantis. SMC Construction, which has also done work on the Atlantis, is the contractor.